Mathew Flinders explored the gulf in 1802. March 9, 1802 'at noon, the furthest hummock seen from the anchorage was distant four or five miles; it stands on a projection of low sandy land, and beyond it was another similar projection to which I gave the name of Point Lowly'. The lighthouse was built in 1883 after the conditions were found to be unsatisfactory for the continued use of a lightship at that location. Materials for it transported by sea from Port Pirie or the rough coastal road from Port Augusta. The city of Whyalla (30km away) did not exist at the time. The lighthouse and its cottages pre-date the establishment of Whyalla and are the oldest European heritage structures in the Whyalla area. The original lighthouse was a 15 metres high sandstone tower with the optical apparatus imported from Chance Bros. England. It was first lit on 1 February 1883. After several incidents north of Point Lowly, the tower was extended to its current height of 22.8 metres in 1909. The first light was an oil wick burner until replaced in 1900 by a kerosene mantle type and then an automatic electric light in 1973. This image belongs to the travel and nature stock photo library. This stock photo of Point Lowly Lighthouse is available for licensing for commercial and editorial uses including websites, blogs, books, magazines, brochures and advertising. Restrictions may apply for images which contain third party copyrighted material or sensitive subjects. Photos of artwork are for editorial use only. 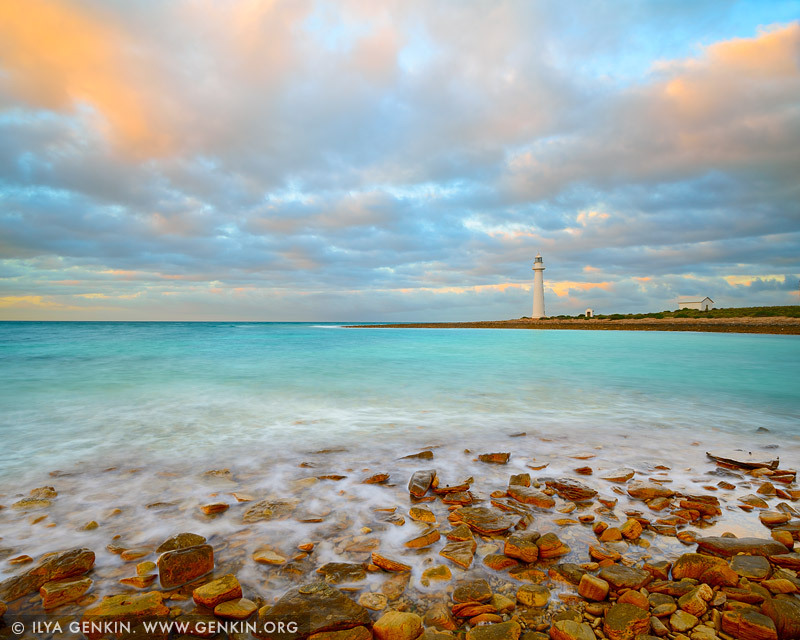 This image id AU-POINT-LOWLY-LIGHTHOUSE-0001 of Point Lowly Lighthouse, is copyrighted © by Ilya Genkin. This is not a public domain image.